Behind The Scenes: CD Review: Hate-Solarflesh Releases Feb 1, 2013(Napalm Records)NEW VIDEO! !Updated March 14! 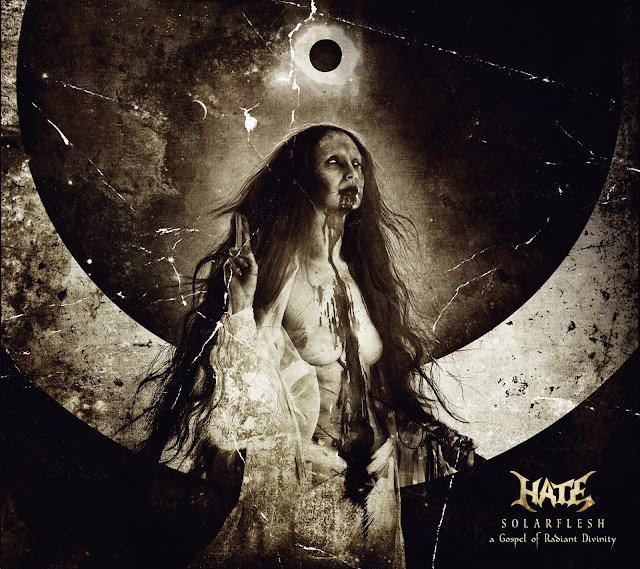 CD Review: Hate-Solarflesh Releases Feb 1, 2013(Napalm Records)NEW VIDEO! !Updated March 14! If the haunting build up of the satanic sounds of the opening song "Watchful Eye of Doom" is any indication of what avenue of music is going to be cast upon us, well it isn't all that bad at all in my opinion. While the lead song has it's crescendo's it peaks out on one. This heavy, dark unrelenting doom metal is played well by this group. As one to not really understand the likeness for Death Metal the more I hear it I hear the differences for certain with each band, this is still new to me-so please have patience. This is not something that you will ever hear on the radio unless there are the stations that will play this music and I fear that Metal of any style does not get the due attention it deserves. I can totally appreciate the tempo of the songs being a drummer I am shocked at how fast these drummers are and they can play these songs + for hours. The overall experience with headphones is the way I hear this one as the others in my house are sleeping. "Alchemy of Blood" would have to be the better song on the album for me. "Sadness Will Last Forever" is another song that shows they are a tight unit. This is overall a very good album I can say that I did enjoy it for the music is more than just one note songs and they have a variance of styles for each song.